The audience at Neville's lecture. 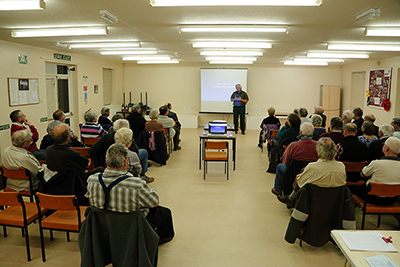 As 7.30 got closer the Sainsbury Hall continued to fill and by the time the meeting started, the hall was nearly full, despite Gales and rain for days. Neville Stanikk, a professional Landscape Photographer and Author started his illustrated talk by telling us about how photography had changed since the 1990's. He showed examples of photo's using 35mm film that sold for hundreds of pounds and similar digital pictures that could be purchased for 10p today! Neville gave examples of out of the way pictures that possibly had a market, explaining that the aim was to produce a picture that anyone going to that location, could see exactly, what the Photographer saw in his viewfinder. After the coffee break the audience were transported to Death Valley and outstanding rock formations of California, with pictures taken by Mr Stanikk on a recent visit. The exceptional light and clear atmosphere meant he produced pictures of outstanding brilliance that made the viewers almost believe they were there in the valley with him. As the visitors and club members left, the comments were that it had been a most interesting evening, enjoyed by all.